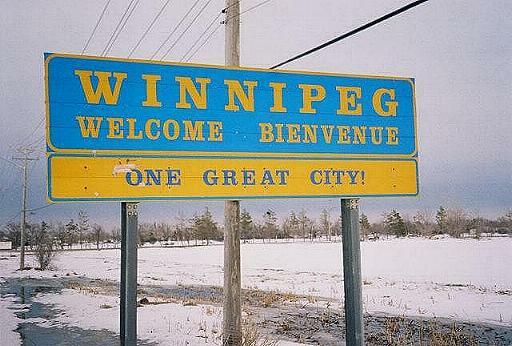 Farewell, Winnipeg! Thanks for the memories! 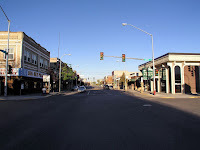 been to this Pacific Northwestern city, I always thought, "Wow, this is a pretty cool town." Portland is the only U.S. city that's always on the "Most Livable Cities in the World" lists. It's known for being environmentally conscious, and for liberal attitudes in general. It has pretty decent public transportation, great culture, food, and green spaces. And there is a jazz scene---but we'll get to that shortly. My wife and I flew out to Portland in July to look for an apartment. Kerry had never been here before, but she was really struck by how lively the Portland downtown area seemed to be. When you look at many cities in the U.S., like Detroit, Baltimore, Rochester, Toledo, St. Louis, etc…you find that downtown is usually a ghost town-people seem to avoid it at all costs. Even in Winnipeg, downtown is kind of dead at times. Portland is one of the few cities where the downtown is still a destination. Portland also has a pretty good public transportation system, which is also a rare thing to find in our auto-centric hemisphere. We looked for 4 days straight for an apartment; we looked at all the quadrants of Portland (Northwest, Northeast,Southwest,Southeast).We even made a trip out to Beaverton, which is a popular suburb of Portland. 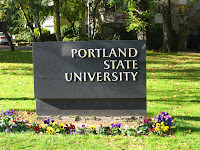 The last place we looked at, and decided to take, was an apartment right across from Portland State University! My commute time will be virtually zero minutes…..
University of Manitoba Summer Jazz Camp. 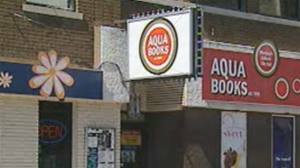 It was a little bittersweet; saying goodbye to friends and colleagues, reminiscing about the good times…I performed in a farewell concert at my favorite Winnipeg venue, Aqua Books. All the usual Winnipeg suspects participated; Steve Kirby, Quincy Davis, Larry Roy, Jimmy Greene, Marco Castillo, Jaime Carrasco. I also asked a lot of the students to sit in. I was quite surprised when, to mark the occasion, Jimmy Greene brought out a farewell CAKE! Again, it's tough to move away from friends, but I promise you, Winnipeg, I shall return someday. Who knew Miles City would be completely booked? We pulled up to my new building at 5:58 PM Pacific Time the next day, with 2 minutes to get keys from the managing agent. After parking the car and decompressing over sushi and beer, Simon and I went back to the apartment and slept on the carpeted floor. I noticed before I went to sleep that my feet were swollen. Erskine on electric bass and Reinhard Melz on drums. Erskine and Melz are apparently two of the busiest musicians on the Portland scene. It was refreshing to hear some music on the fusion side; I've lamented the lack of appropriate venues in New York for this sort of music. 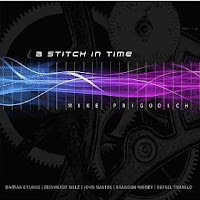 Prigodich's band bristled with energy, yet maintained a tasteful volume. After listening to a set and wolfing down some excellent pizza, we drove over to the Northeast to a place called the Afrique Grill. A young trombonist named Javier Nero was performing with his quintet. Nero was a student of mine when I taught adjunct at the Juilliard School of Music; he was in my remedial piano class; thus, I didn't really ever hear him play trombone! Nero impressed me with his virtuosity and musicality; his linear concept remind me of guitarist Kurt Rosenwinkle more than the assumed trombone influences. I think Nero has a lot of potential as a trombonist, and as a composer. (It was nice that Nero let me sit in with the band; I was itching to play some music after all that driving.) Nero has one more year at Juilliard; I'm hoping to convince him to do his Master's degree at PSU…..
likes of Charlie Hunter.) Hutchinson's concept struck me as very contemporary, even though the first tune of the night was a chilled out version of the classic "Stella By Starlight." This trio was more about sound design than super burning linear excursions; Deutch used what he said was a custom made delay pedal to superbly personalize the Rhodes patch on the Nord Electro keyboard. 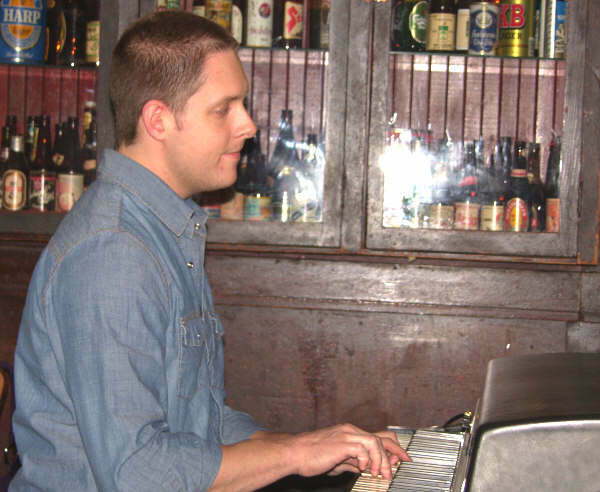 Deutch combined that with expert use of the in-house Hammond B-3 with his left hand. Hutchinson presented his musical vision well; his compositions seemed not too concerned with "drumistics" as can be the case with composing drummers, but more with the overall vibe. A slick arrangement of David Bowie's "Life on Mars" was a memorable moment in the set. I drove Christie to the airport very early the next morning. Since my wife and son wouldn't join me in Portland until the beginning of September, I figured I should enjoy being a free man, and go hear some more music! The next spot was in the Pearl District, a place called the Camellia Lounge, which is inside a restaurant called The Tea Zone. I sat with some delicious ginger tea and listened to acoustic bassist David Friesen's band, which featured Greg Goebel on Fender Rhodes and John Gross on Tenor Saxophone. Friesen's music is quirky and intriguing; the melodies aren't necessarily catchy, but they quickly create a mood, which is a great catalyst for solos. 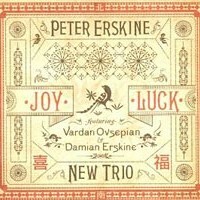 Dissonant harmonies pervade Freisen's improvisational vehicles, and yet, because of the absence of drums, the band created a very pleasant, listenable, chamber music vibe. The bassist Phil Baker informed me that Sunday nights in Portland are a good time to check out Clyde's in Northeast for the Ron Steen Trio Jam Session. It's a bit of a drive from downtown, but since there's no TV or internet in the apartment yet, I decided to go check it out. It's quite a scene. First of all, I will again say that the food is good at Clyde's; I had a Mediterranean Pasta for $11 that really hit the spot, as well as a delicious Key Lime Pie. I sat and listened to Ron Steen and his trio, which featured bassist Baker as well as someone they kept calling "Professor", Mr. Phil Goldberg on piano. This is a jam session that reminded me of the jam session's I used to attend, and then actually host for a while, at Twins Lounge in D.C.. Clydes was soon packed with horn players and vocalists who were eager to get on stage. It was quite a lively bunch, I must say. However, drummer Ron Steen kept everything civil and organized, and he presided over the affair with a lot of warmth and humor. Of course, I played some piano, trumpet, and melodica. Jam sessions can still be a great learning experience, and I certainly had a good time jamming at Clyde's. My last stop for the week was Monday night at Jimmy Mak's(which is the main jazz club in Portland). I walked down 10th Avenue (Imagine, a major jazz club within walking distance!) 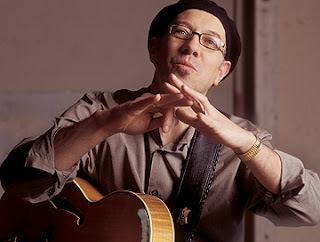 to see guitarist Dan Balmer with his fusion trio. Balmer is a Portland native; he spent years on the road with vocalist Diane Schuur. Balmer reminds me a bit of guitarist Paul Bollenback, who I have worked with quite a bit, in that, like Bollenback, he seems to be able to in almost any musical direction. I'm supposed to play with Balmer in late September;this will probably be my first official gig as a Portland resident. I'm looking forward to it, and also eagerly anticipating becoming more acquainted with the Portland jazz scene. I'm glad you found a place close to your work. I think you will find Portland very much to your liking. If you missed the book store in Winnipeg, make sure you visit Powell's books in Portland which is ( I believe) one of the largest in the country. Also, make sure you hit all of the McMenimens' establishments which includes the Kennedy School right in Portland. USed to be a school and is now an inn with a restaurant, great music and great bars including one called "Detention." Great atmosphere. The McMenimens use all local artists to redecorate the places they refurbish and the results are magnificent. Make sure you see the Decemberists while you are in Portland as it is their base. They are not really jazz, but folk/rock and really terrific. Also make sure you get a "Keep Portland Weird" bumper sticker for your car. After a while there, I am sure you will agree with the sentiment. Also, enjoy the exceedingly mild weather. Congratulations on your tenure position! That is wonderful news! My husband's family lives in Beaverton so we are in Portland occasionally to visit and I would love to see you perform so keep in touch and best of luck in Portlandia! Welcome to Portland! I grew up there ... PSU is a great place for jazz -- get to know my old trombone teacher, Ben Medler, who I think teaches there as an adjunct. He and his wife, saxophonist Michele, are both great players. 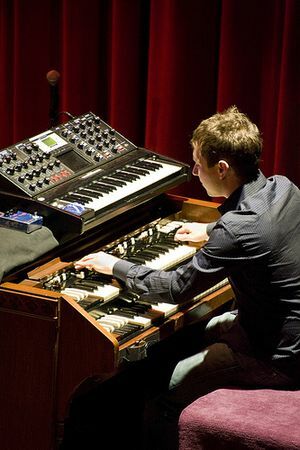 Deutch combined that with expert use of the in-house Hammond B-3 with his left hand. 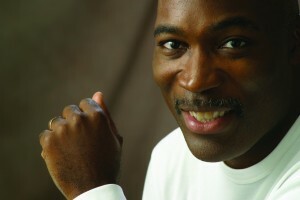 Hutchinson presented his musical vision well; his compositions seemed not too concerned with "drumistics" as can be the case with composing drummers, but more with the overall vibe. 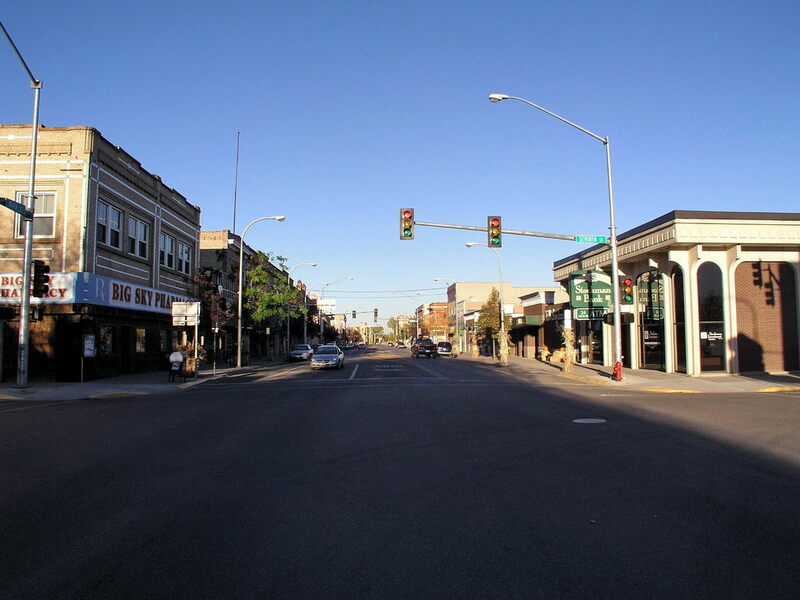 We even made a trip out to Beaverton, which is a popular suburb of Portland. 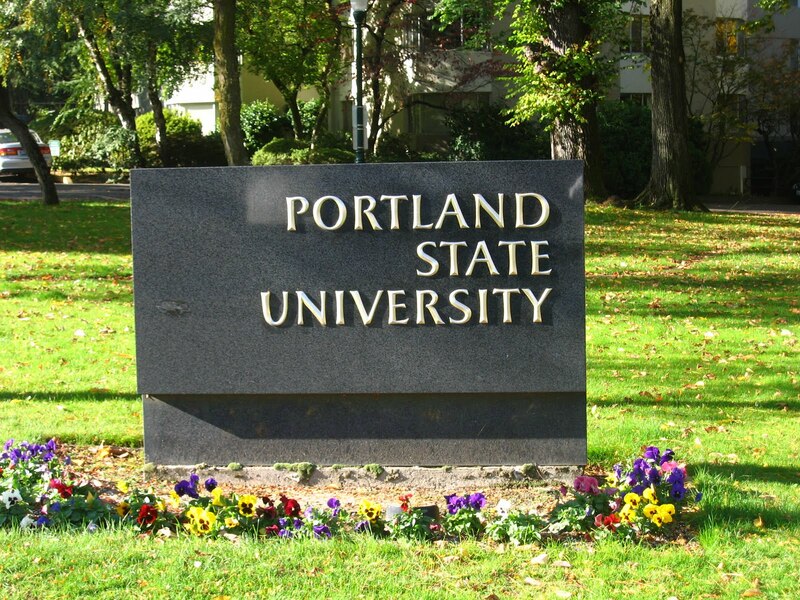 The last place we looked at, and decided to take, was an apartment right across from Portland State University! My commute time will be virtually zero minutes…..
With the approval of Diem, Nhu used the declaration of martial law to order armed men into the Buddhist pagodas. Nhu purposely chose a time when the American Embassy was leaderless. Excellent your drawings. Very good art. Did you want to see me broken?Bowed head and lowered eyes?Shoulders falling down like teardrops.Weakened by my soulful cries. foundation ventsAccident InsuranceBig Butte Creek is a 12-mile-long (19 km) tributary of the Rogue River in the U.S. state of Oregon. It drains approximately 245 square miles (635 km2) of Jackson County. The north fork of the creek begins on the slopes of Rustler Peak and the south fork's headwaters are near Mount McLoughlin. Flowing west, they meet near the city of Butte Falls, and the main stem flows generally northwest until it empties into the Rogue River about 1 mile (1.6 km) southwest of William L. Jess Dam and Lost Creek Lake. how to franchise a businessHotelscom Discount CodesVarious negligence cases were brought against the police by spectators who had been at the ground on the day, but had not been in the pens, and by people who had watched the incident unfolding on television (or heard about it on the radio). A case, Alcock and others v Chief Constable of the South Yorkshire Police  1 A.C. 310, was eventually appealed to the Appellate Committee of the House of Lords and was an important milestone in the law of claims of secondary victims for negligently inflicted psychiatric injury. It was held that claimants who watched the disaster on television/listened on radio were not 'proximal' and their claims were rejected. adhesivespanish discount propertyThere are 193 member states, including every internationally recognised sovereign state in the world but Vatican City. From its offices around the world, the UN and its specialized agencies decide on substantive and administrative issues in regular meetings held throughout the year. domainsThe outer suburbs comprising the former municipalities of Etobicoke (west), Scarborough (east) and North York (north) largely retain the grid plan laid before post-war development. Sections were long established and quickly growing towns before the suburban housing boom began and the emergence of Metro Government, existing towns or villages such as Mimico, Islington and New Toronto in Etobicoke. Unlike the indicative, the subjunctive does not modify the thematic vowel. The third conjugation's thematical remains short as an e, and the fourth conjugation does not use an iē before the imperfect signs. It keeps its ī. In the subjunctive, the imperfect employs its tense signs re and rē before personal endings. The verb esse (to be) has two imperfect subjunctives: one using the present infinitive (essem, esses, esset, essemus, essetis, essent) and one using the future infinitive (forem, fores, foret, foremus, foretis, forent). 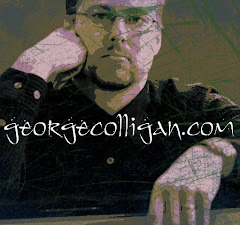 How To Be A Great Jazz Musician ….In One Lesson!